It isn't often that I go out for an evening bike ride, I ought to go out more often as I love being out at that time of the day. 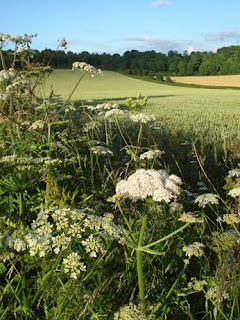 For once it was a beautiful sunny, warm and wind free evening and I cycled over some the local hills. There have been some superb clouds again recently, what with the changeable weather and it was wonderful to be out watching the sun, clouds and light changes as the evening drew to close. I saw the odd muntjac deer but also a couple of young foxes playing at edge of some woodland not too far away from me. I occasionally see the odd one, but rarely have I seen two like this. Whilst standing in a patch of woodland with my bike just wondering what I could see and hear, I was suddenly away of something on the path next to me. On looking round I saw a Hare only about 6 feet away from me. It turned a bolted away with just a faint padding sound. I was surprised it had approached me so closely, but perhaps its mind was thinking of other things and wasn't paying attention to what was in front of it. The evening light was superb and there were some good colours amongst the cumulus clouds. I'm still exploring the potential of my digital camera and but often forget to just play around with it. 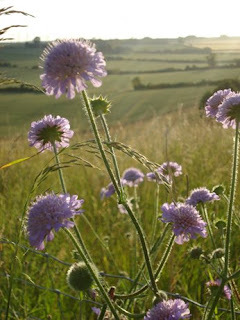 This scabious, on top of a hillside with the sun setting behind it, was providing a good evening snack for a bumble bee. I ought to explore some more sort of arty photographs. With my old film camera it was always expensive playing around. I wouldn't have taken photos into the sun before, but this scabious looked beautiful with it's lilac flowers surrounded by a ring of transluscent petals.